Example video - offline render in Quartz Crystal then resynced in GarageBand with an original audio doodle using GarageBand's in built atmosphere loops. another example , using the posted DAE. 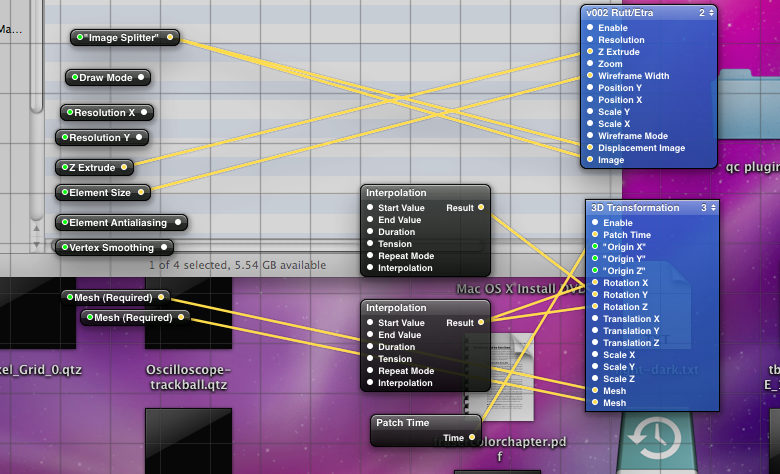 When I get to bring in Live Input with reliability, I'll be exploiting that Audio Tools facility. Excuse the file size - caused mainly by the .wav file that 3D Sound Player uses [ the .aiff format was no smaller]. Exploits v002 Rutt Etra, DAE Meshes, Render in Image, 3D Transform. 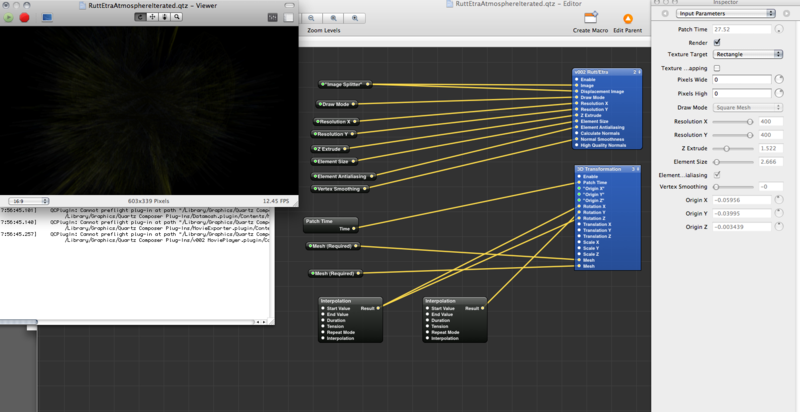 I'm looking forward to engineering a Particles Tools based and Kineme3D Tools based equivalent to this. this looks very cool. it seems i'm getting a bunch can not publish binding issues with the rutt etra. i'm attaching a screen shot of the spot i think where some of the connections are broke. maybe you can tell me where they connect so i can manually link. check screen shot looks like just a few connections. great usage of the 3d audio by the way. Sorry to hear you are having problems with this composition. I downloaded the upload on this thread, put it to the test and couldn't reproduce your GF Log results. Then I remembered that during the dev stage of this comp I had similar messages, which usually resulted form trying to make negative values work where only positive results would work. I did update the composition on the 6th Feb 2010. The error you remind me off in your post is pretty much why I updated the composition as the previous construct would result in such odd errors. Just been running the downloadable composition for a half hour non stop and no errors in GF Log thus far - now off to work :-) I think I might just leave this one running on soak test today and see if it does spit out any such errors - none thus far. thanks bud. i tried to manually to put them together. i will put some more effort into tracing down the broken connections when i get home later. its really hard to manually reconnect when quartz doesn't honor the published ports. if it just broke the connections and left the published ports i think it would be fairly easy to string back together. no biggy my friend. 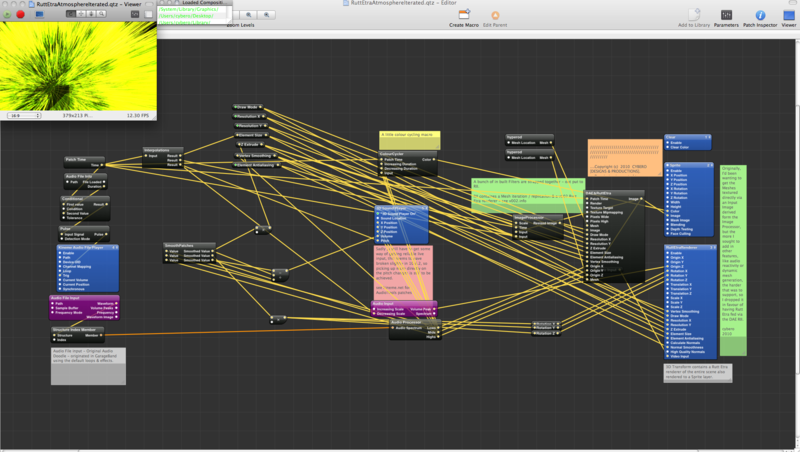 i'm doing a vj thing tonight and was just trying to put some reactive content together for the other vj. maybe i will stop by your site and grab some of your apps as my friend is on 10.6.2 and well he has a new machine which wont run quartz but QB runs great so was trying to put together a few things for him to play instead of the old here lets fade some video clips type of thing. i was able to save a few pieces from last months hard drive crash so more than likely i can spend some time putting together some QB files for my mate. its down to the last few hours just like last week. never enough time in my day to get all the things done i want to do. got to focus on the important things i guess. vjing isn't really at the top of my list at them moment but its nice to finally get since my divorce. dust, just realised - you needed to see the inside of the RII - see RII internals screengrab - also do check to see if path to assets exploited from ./Media/ & / or ./DAE/ have retained integrity. enjoy the VJing :-) . BTW - I've just noticed that you have a different version of Rutt Etra, one that incorporates a different set of configurable inputs to the version I'm employing. I can't help but wonder if that is significant. The version I've used is 2.0.1 3rd of January 2010 issue.